...anyway... after prattling on about it... I'll leave you with these... we cannot possibly be the only signs of life in this Universe... we just can't be... and thanks for your thread kxk... it really was an inspiration to me... ... cheers. ...just an example of what this thread is about... images and a video from NASA on cyclone Debbie... wow!... on this website link below... cheers. This image of rainfall totals shows the heaviest rains appear in purple over the Coral Sea as Debbie approached landfall in Queensland, Australia. IMERG indicated that rainfall totals were greater than 500 mm (~ 20 inches) along many parts of Debbie's track. IMERG indicates that the most extreme rainfall fell along the coast where Debbie came ashore. ...I've just realised something... this thread should've probably been posted in 'The lounge' most likely when I think of it... if so... could someone in Admin (Brekkie or Marquisite?) move it over to there please?... if it's okay in here then that's fine too... sorry about that... on occasions I'm just a nerdy spacenik nuff nuff sometimes!... lol!... cheers. ...here is a great video of what to expect in the oncoming future... and and below some memorable shots taken by Cassini in the past... R.I.P Cassini... farewell old friend... cheers. Oooooo, I love @Mr Stickyfingers - what fantastic pics. Saturn is such a pretty planet. And what is that last white up close pic of? I just loved the whole stargazing experience, it helped me a lot at a time of family dis-function, we are so tiny and insignificant. 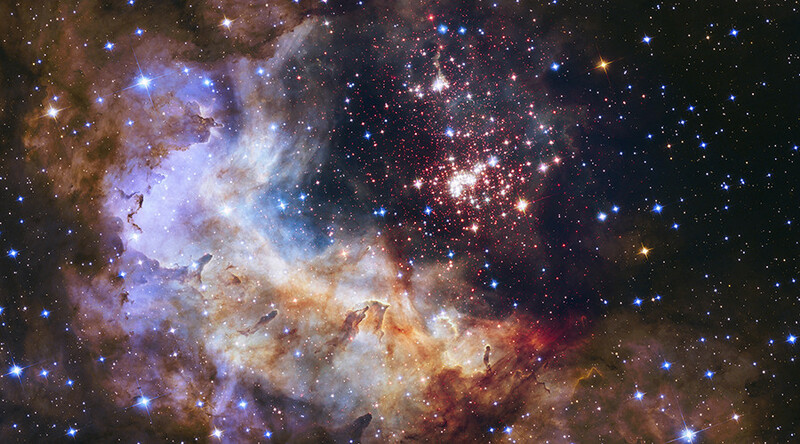 The Universe is so enormous and stunning, and how much do we forget every day the wonder all around us. ...it's Saturn's moon 'Enceladus' kxk... on this website below is some really interesting things about it... my sweet darling wife and myself have visited the Jodrell Bank Observatory with the giant Lovell Telescope near Manchester in Encland about 30 years ago... it was so fascinating... we've also visited the Parkes Observatory in NSW a while back too... I was in Heaven when I visited both places believe me lol!... cheers. Scientists have found a large body of water beneath the surface of Enceladus. An ocean detected on Saturn's moon Enceladus (above) lies between ice and rock about 25 to 30 miles (40 to 48 kilometers) below the surface. A substantial ocean most likely exists beneath the icy surface of Saturn's diminutive moon Enceladus, raising the possibility that primitive forms of extraterrestrial life exist in its briny depths. The ocean lies between the moon's rocky core and a layer of thick ice, and is estimated to be about the size of Lake Superior. That's large for a moon that is only 310 miles (500 kilometers) in diameter and could fit within the borders of Arizona. In our solar system, the only other moon known to have similar contact between liquid water and rock is Jupiter's Europa. Both the rock and the water are considered to be essential for the chemistry that could, over eons, turn nonliving matter into living entities. "The main implication of our work is that there are potentially habitable environments in our solar system that are entirely unexpected," said Luciano Iess, an aerospace engineer at the Sapienza University of Rome and lead author on the study published Thursday in the journal Science. The surface temperature on Enceladus is -180 degrees Celsius (-292 degrees Fahrenheit), but enough heat is produced by tidal forces that flex and melt the ice to create liquid water below. That the ice is heated by the effects of Saturn's gravity—the source of those tidal forces—rather than by radiation from the sun, Iess said, reinforces the theory that even distant and frigid celestial bodies might be habitable. "This strong indication of a regional sea under the ice on Enceladus heightens our interest in Enceladus as a possible habitable world," said Carl Pilcher, former director of NASA's Astrobiology Institute. Scientists were surprised in 2005 when images taken by the Cassini-Huygens mission revealed substantial jets of salty water were spitting out from the south pole of Enceladus. Later, close flybys produced dramatic photos of the geysers and the additional discovery of carbon-based, organic compounds being released from nearby darkened fissures called "tiger stripes." During three flybys Cassini made of Enceladus between 2010 and 2012, scientists studied the moon's gravitational field in detail by measuring ever-so-slight shifts in the satellite's path. The gravitational field of a moon or planet subtly varies due to changes in the density and amount of land or liquid across its surface. The changes in that field can affect a spacecraft orbiting above. Cassini scientists used Earth-based radio telescopes from the Deep Space Network to measure those tiny gravity-induced changes in the satellite's path, and to then indirectly map facets of the moon below. Comparing those gravity measurements with the moon's topography allowed researchers to conclude that large amounts of liquid water were present well below the surface. Key to the research is the fact that liquid water is 7 percent more dense than ice, which means it produces a greater gravitational effect. "To get our data, we had to detect exquisitely small changes in motion with a pretty impressive precision," said co-author David Stevenson, a planetary scientist at the California Institute of Technology in Pasadena. "That was new, but the rest of the story of how to understand masses from our data is basically Newton's laws of motion." Stevenson said that while the team's understanding of the water on Enceladus remained "somewhat fuzzy," members were quite confident that a reservoir had been found about 25 to 30 miles (40 to 48 kilometers) below the surface. The ocean, or sea, is estimated to be in a layer about 6 miles (10 kilometers) from top to bottom, lying between ice and rock. The team was convinced that the water was present in the south polar region—where the geysers and tiger stripes are found. However, there was not enough data to determine whether it might spread farther around the globe, Stevenson said. The ocean under the surface ice of Europa, a much larger moon, has been determined to circle its globe. Although the gravitational data painted only a very rough picture of the composition of Enceladus, the findings go a long way toward explaining some of the surprising features of the tiny and frigid moon. In a teleconference Wednesday, several members of the team said it was increasingly plausible that the water vapor in Enceladus's geysers is coming from the subsurface ocean and up through what Stevenson called the moon's "plumbing," to the tiger stripe region on the surface. Jonathan Lunine, a planetary scientist and astrobiologist at Cornell University in Ithaca, New York, and another member of the Cassini team, said the organic material detected earlier in the plume and around the tiger stripes increases the possibility that some form of life exists, or once existed, on Enceladus. So too does the new finding that the moon's ocean sits on bedrock. "Like at the bottom of our oceans, liquid water would seep through the rock and pick up nutrients and get warmer," Lunine said. "This makes the interior of Enceladus an attractive potential place to look for life." Finding that life, though, wouldn't be possible with Cassini. The spacecraft's spectrometer initially detected the organic material on the moon. 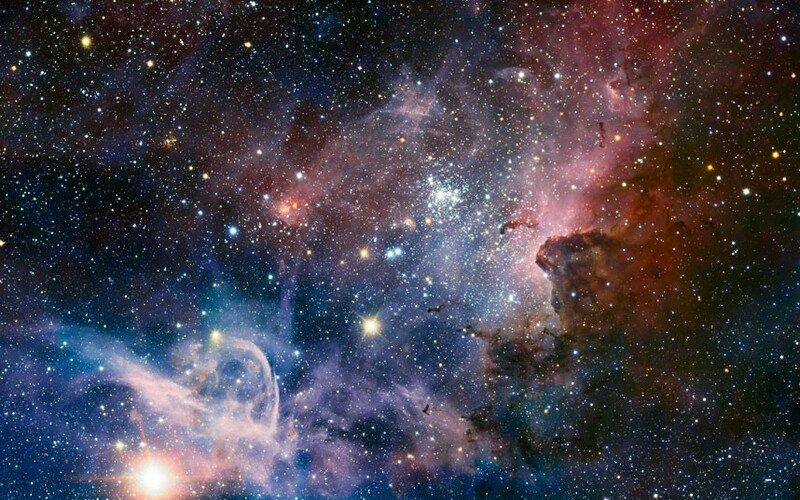 However, Lunine said, a far more powerful instrument would be needed to determine if complex organics and possibly life existed in the liquid water. Cassini has been in orbit around Saturn since 2004 and is expected to pass by Enceladus three more times before the planned end of its mission in 2017. The Cassini team hopes to navigate the spacecraft through the geyser plume during one of the flybys to get an intimate look at its composition. "More studies of the plume material, particularly a sample return," said Pilcher, "would help us understand if life might even exist on this small moon." Looks like a spectacular and beautiful sculpture. The US space agency says the new findings come from both the agency’s Cassini spacecraft and the Hubble Space Telescope. 'These new discoveries will help inform future ocean world exploration - including NASA’s upcoming Europa Clipper mission planned for launch in the 2020s - and the broader search for life beyond Earth,' NASA said. It will reveal the finding at 2pm on Thursday - but refused to give any more clues. Jupiter's sixth-closest moon Europa is one of the most interesting bodies in our solar system when it comes to the hunt for extra terrestrial life. The event, to be held at the James Webb Auditorium at NASA Headquarters in Washington, will include remote participation from experts across the country. The include several members of the Cassini team, raising speculation the announcement could be a revelation about Jupiter's sixth-closest moon Europa, ahead of the 2020 Europa Clipper mission, or Enceladus, the sixth-largest moon of Saturn. Jupiter's sixth-closest moon Europa is one of the most interesting bodies in our solar system when it comes to the hunt for alien life. The moon, which lies 500 million miles from the sun, has an ocean lying beneath its surface which makes it one of the most likely places in the solar system for life to thrive. Because Europa has the potential to have more liquid water than we have on Earth, some have speculated that the surprise reveal could be evidence for life. The 1,900-mile-wide (3,100 km) moon harbors a huge ocean of liquid water beneath its icy shell. Astronomers think this ocean is in contact with Europa's rocky mantle, making all sorts of interesting chemical reactions a possibility. 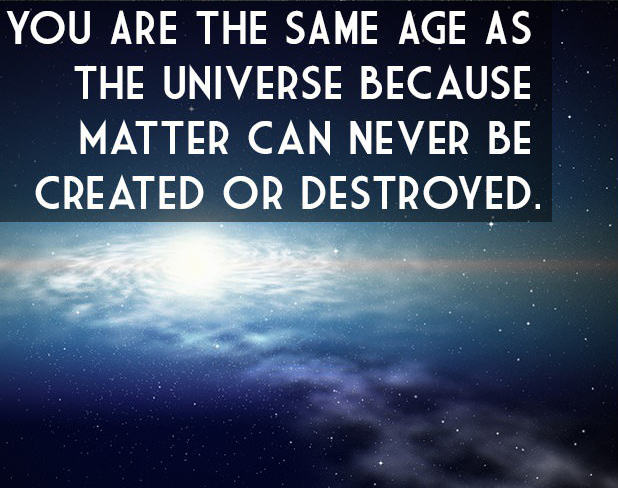 Instead of direct evidence of life, however, experts have said it is more likely to be a step towards finding it. Jupiter's icy moon Europa is slightly smaller than Earth's moon. Europa orbits Jupiter every 3.5 days and is tidally locked - just like Earth's Moon - so that the same side of Europa faces Jupiter at all times. It is thought to have an iron core, a rocky mantle and a surface ocean of salty water, like Earth. Unlike on Earth, however, this ocean is deep enough to cover the whole surface of Europa, and being far from the sun, the ocean surface is globally frozen over. Many experts believe the hidden ocean surrounding Europa, warmed by powerful tidal forces caused by Jupiter's gravity, may have conditions favourable for life. The announcement could be related to faint plumes of water spotted on the moon back in 2012. Hubble used a spectrograph to see normally invisible plumes of water vapour, shown in pictures as blue pixels above the moon. 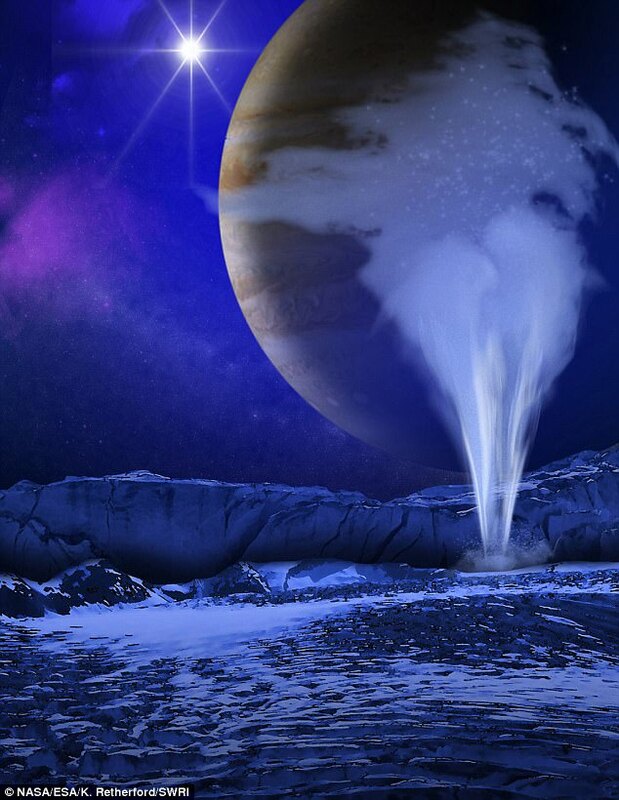 'By far the simplest explanation for this water vapour is that it erupted from plumes on the surface of Europa,' lead author Lorenz Roth of Southwest Research Institute in San Antonio said at the time. 'If those plumes are connected with the subsurface water ocean we are confident exists under Europa's crust, then this means that future investigations can directly investigate the chemical makeup of Europa's potentially habitable environment without drilling through layers of ice. Bill McKinnon, a planetary scientist at Washington University in St. Louis, told Business Insider the announcement is likely to be connected to these plumes. Cassini’s mission will officially terminate on September 15, in a planned plunge. Since it left earth in 1997 and arrived at Saturn in 2004, Cassini has been touring the system with an up-close study of the planet, its rings and moons. During its journey, Cassini has made dramatic discoveries, including a global ocean within Enceladus and liquid methane seas on Titan. Before Nasa's Cassini probe captured the most detailed images of Saturn ever seen, it dropped its companion Huygens on the planet's largest moon, Titan. After nearly 20 years in space, the mission is drawing near its end because the spacecraft is running low on fuel. ...and yes... I'm geeky enough to stay up late that night to watch it Live too lol!... AND... for those people that don't know... this is a link to watching NASA TV Live just for good measure too... cheers. ...and the video of the conference itself... cheers. "It was October 15, 1997, when NASA's Cassini orbiter embarked on an epic, seven-year voyage to the Saturnian system. Hitching a ride was ESA's Huygens probe, destined for Saturn's largest moon, Titan. The final chapter of the interplanetary trek for Huygens began on 25 December 2004 when it deployed from the orbiter for a 21-day solo cruise toward the haze-shrouded moon. Plunging into Titan's atmosphere, on January 14 2005, the probe survived the hazardous 2 hour 27 minute descent to touch down safely on Titan’s frozen surface"
...that's the end of part 1... cheers. 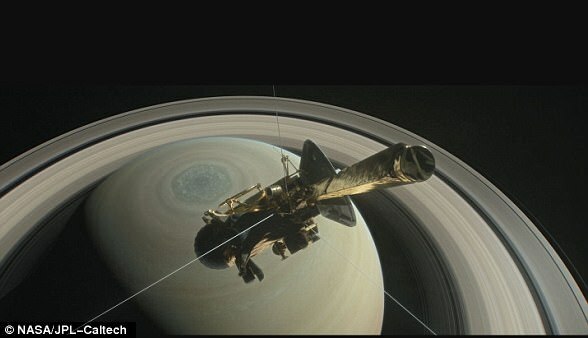 ...for all stories of Saturn and Cassini on NASA's website click on this link below... cheers. ...but just knowing that I can get all of that information makes me feel good regardless lol!... so yeah... if you can't afford your own Telescope well this is the next best thing lol!... by the way... all of the images are of the Northern Hemisphere only obviously being that it's in the USA lol!... another couple of good websites for images of Space/Space Telescopes etc are on these 2 links below... cheers. Elias Aboutanios of UNSW with one of the ‘CubeSats’’ launched in the US. The launch of three Australian satellites may be one small step in the worldwide space industry but it’s a giant leap for local universities and start-ups looking to the stars. At 1.11am (AEST) yesterday, a rocket blasted off from the Cape Canaveral launch pad in the US carrying 36 satellites, including the first Australian satellites to be sent into orbit in 15 years. Two of the Australian satellites were designed and built by teams from the University of Sydney and the University of NSW. The third was from the University of Adelaide and the University of South Australia. “Successful launch! The University of Sydney is in space! 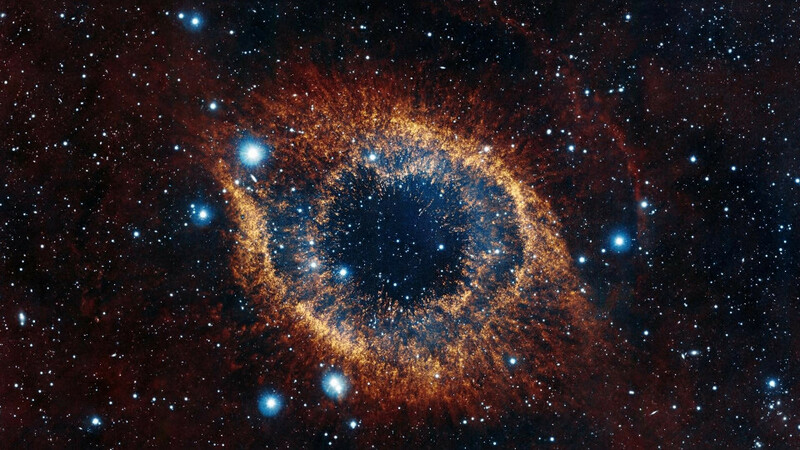 All perfect,” Sydney University space physics professor Iver Cairns said from Florida. It has taken the UNSW team about six years to get to launch day, according to the director of the Australian Centre for Space Engineering and Research, Andrew Dempster. “There is a lot of waiting but it’s actually quite satisfying now that the launch has actually happened,” Professor Dempster said. The satellites’ main mission is to monitor the thermosphere — a region between 200km and 380km above Earth — in collaboration with 50 universities. Also on board Australia’s small “CubeSats” is experimental technology invaluable for the UNSW team to see in action. One of the 1.3kg satellites is built from a 3D-printed material which has never been in space before. Also, a new computer chip will hopefully stop the satellite from crashing when hit by cosmic rays. Completing the project without an astronomical budget was a big achievement, said UNSW’s dean of engineering, Mark Hoffman. “We used to think of space as a place only big-budget space agencies could play in (but) the advent of cheap and powerful CubeSats has made space accessible,” he said. Sydney start-up supporter Delta V SpaceHub hopes to capitalise on this accessibility by helping companies develop space services such as 3D-printing solid rocket motors or developing new liquid fuels. Delta V boss Tim Parson said yesterday’s launch came at a key moment. “We’re hoping this year we’ll have an announcement to form an Australian space agency,” Dr Parsons said. ...if you hear a loud 'whooshing' noise go by and wonder what it was then it could be this lol!... 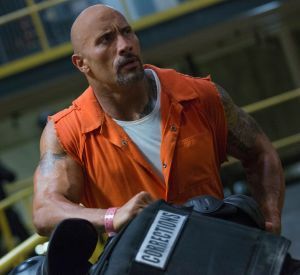 I did have a big laugh at this comment though... "We are still undoing all the damage that 'Armageddon' did... Bruce Willis destroyed 10 years of science communication efforts in one poorly made movie... we're just not going to have a rogue asteroid that comes out of nowhere to destroy the Earth."... that really cracked me up lol!... from this website below... cheers. A huge asteroid travelling at 33 kilometres a second will sail past the Earth on Thursday morning, reminding us all that the universe is a very dynamic and potentially dangerous place. "This tells us how active space is - it's not static," said Brad Tucker, an astronomer at the Australian National University. Kilometre-wide asteroid 2014-JO25 will sail past Earth on the morning of Thursday, April 20. 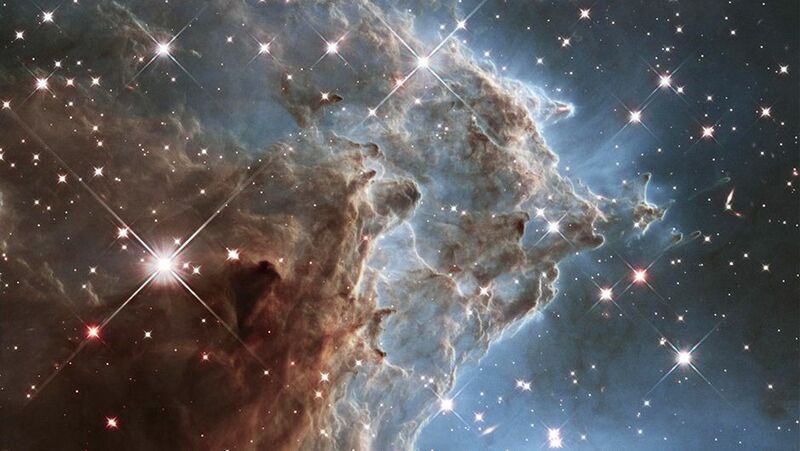 "We are so used to hearing astronomers describing objects as light years away. Close encounters with asteroids are things that happen on a real timescale." Asteroid 2014-JO25 is a kilometre across and will come closer to the Earth than any asteroid of its size in 13 years. However, it will sail safely past at 4.6 lunar distances - about 1.8 million kilometres away. 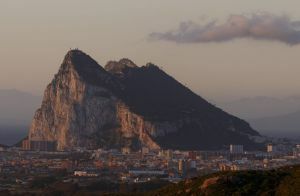 Scientists in the US have nicknamed the asteroid "The Rock" either in honour of action hero Dwayne Johnson or after the Rock of Gibraltar, depending on who you ask. Professor Tim Bedding, head of the school of physics at the University of Sydney, said: "If an asteroid this size hit Earth, it would be catastrophic. "If it hit an ocean, the tsunamis it would raise could wipe out coastal cities. If it hit land, it would be a different scenario but in both cases completely catastrophic." 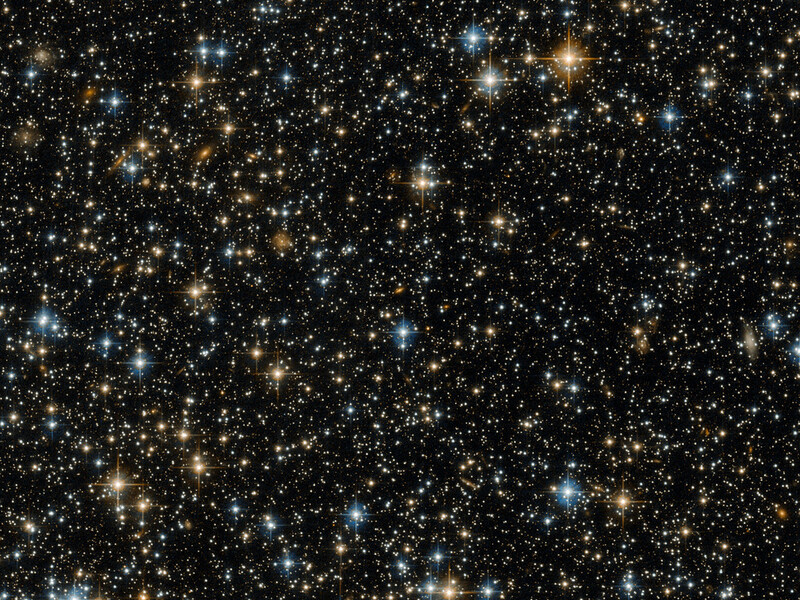 Dr Tucker said: "In the grand scheme of things, yes it is close because space is big. If it hit, its impact would be on the order of 10,000 megatons of TNT." But the asteroid poses no threat to Earth. Dr Tucker said: "Our real worry is not something a kilometre long, that's easy to spot. We know where most of these are. "Something much smaller, such as the one that exploded over Chelyabinsk in Russia three years ago is more of a threat. That could come out of nowhere. That was about 10 or 20 metres - and that can cause enough damage if it hits the right place. Those, we know only a very few per cent." Dr Tucker said: "We are still undoing all the damage that Armageddon did. Bruce Willis destroyed 10 years of science communication efforts in one poorly made movie. "We're just not going to have a rogue asteroid that comes out of nowhere to destroy the Earth." Professor Bedding said: "The most important thing is to detect big asteroids early so you can measure accurately their orbit. And if there is a chance they might intersect with Earth you have - hopefully - years or even decades to do something about it." Dr Tucker said: "Yes, we are going to have something that hits the Earth eventually. That is inevitable. But the planet has been around for 4.5 billion years and we only know of a few rare instances of very large impacts, so they are not common." 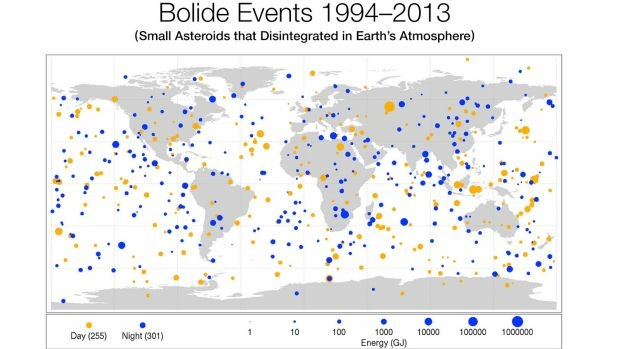 NASA tracks asteroids as part of its Near Earth Object program. The object that poses the greatest impact threat to Earth is asteroid 29075, which is 1.3 kilometres long. 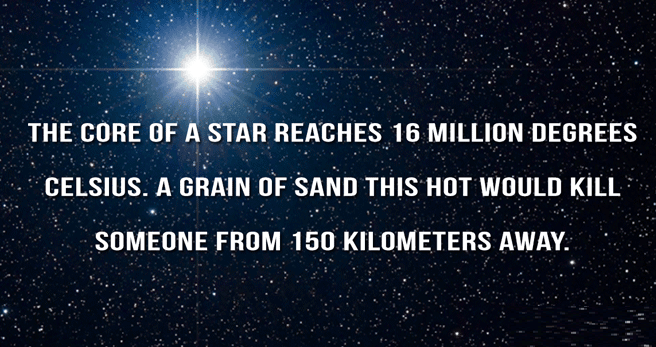 NASA estimates it will come close to Earth on March 16, 2880. The probability of impact is one chance in 8300. 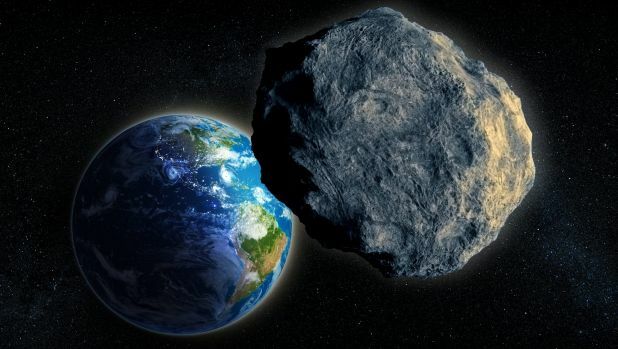 This means there is a 99.988 per cent chance the asteroid will miss the Earth. Next month in Japan, NASA is holding a "Planetary Defence Exercise", simulating how agencies would react to the approach of an asteroid between 100 and 250 metres wide. The simulation will assume a possible impact 10 years later, in 2027. Dr Tucker said: "Every 100 million years or so you could expect one of these kilometre-sized asteroids to hit and release 10,000 megatons worth of energy - that's about half a million atom bombs the size of which destroyed Hiroshima in 1945." The asteroid that triggered the mass dinosaur extinction events 66 million years ago was 10 times the size of "The Rock". The robotic telescope service Slooh will be screening a live fly-by of the asteroid, which will be closest to the Earth at 9am on Thursday. 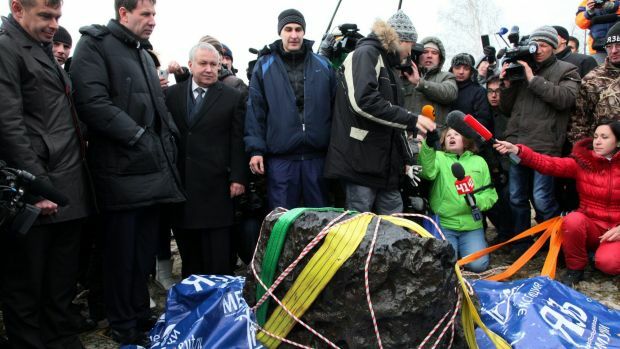 Professor Bedding said: "There are few clever ideas about how to move asteroids if any become a serious threat to Earth. You could paint one side of an asteroid black so it heats up in a particular way and the solar heat causes it to move out of harm's way. "Breaking it up into pieces like in Armageddon won't help as the pieces all come and hit the Earth anyway." Other proposed methods do involve using nuclear weapons to deflect an asteroid's trajectory, or using lasers over time to push the object off a collision course, or pushing the object using ion thrusters or other engines. ...and more from that post above about that Comet from this newly discovered website (for me at least)... ooooh goodie!... yet another Space website for me to tinker around on lol!... I love it!... this is what the main page and then the Comet pass-by page looks like and also the links to them above the images... cheers. People in some of Australia's southern states could witness the Aurora Australis tonight. According to the Bureau of Meteorology, the dazzling Southern Lights may appear in the sky over Tasmania on Friday night and could also be visible in far southern Victoria. The phenomenon occurs when charged particles emitted by the sun reach Earth and interact with gases in our atmosphere. The colour of the display is determined by the gases involved in this process. Oxygen causes green and sometimes red (this is rare) and Nitrogen can produce blue or purple lights. Unfortunately, cloud cover may hinder the view tonight thanks to an upper level low pressure system moving over Victoria. The best chance of clear skies will be in southern Tasmania early in the evening away from anthropogenic light pollution. ...**sigh**... I'm sure going to miss this little guy when he burns up in Saturn's atmosphere... I've been following him around for 12 to 13 years or so... it'll be like losing an old mate lol!... on this website below... cheers. As Cassini wraps up its 13-year mission in Saturn's system, scientists are preparing for the spacecraft's final burst of observations in the never-before-explored region between the planet and its inner rings. Cassini crossed Saturn's ring plane for the first time today (April 26). Next, after a series of 22 orbits and close flybys of the rings, the robotic probe will take a death dive into the planet's atmosphere on Sept. 15. "I have another five months to get very emotional about it," Coustenis told reporters yesterday (April 25) during a news conference at the annual meeting of the European Geosciences Union (EGU) in Vienna. "In the meantime, we're going to have the opportunity to top off this wonderful mission with a lot of new measurements for the rings and for Saturn's interior." The north pole of Saturn and its mysterious giant hexagon storm structure, as captured by the Cassini spacecraft on Dec. 2, 2016. Cassini was 619,000 miles (996,000 kilometers) from Saturn when the image was taken; each pixel covers 37 miles (60 km). Since 2004, the Cassini space probe has orbited Saturn, collecting photos and data that have revolutionized our understanding of the planet and its moons. Cassini recently obtained some of the closest-ever images of the outer edges of Saturn's main rings. During the spacecraft's upcoming ring-skimming orbits, scientists anticipate that they'll get an even better look at strange features in the rings' structure, such as the clumps of ring particles known as "straw" and structures known as "propellers" that are thought to be produced by the gravitational pull of Saturn's moonlets and sometimes stretch several thousand miles long. Cassini's final observations also promise to provide even better images of smaller moons — like ravioli-shaped Pan, ring-sculpting Daphnis and the flying-saucer-like Atlas — that orbit in the gaps between Saturn's rings, Coustenis said. She added that scientists will get views of Saturn's northern hemisphere in greater detail, which could offer new information on the planet's clouds and hazes at different altitudes, and observations of auroras could provide new insight into Saturn's magnetosphere. Cassini's next five months could reveal new clues about the somewhat mysterious interior structure of Saturn, too. "Magnetic field and gravity measurements are the only tools that are able to go deep, below the cloud layer," Iess told reporters at the news conference. "They tell us about the deep interior structure of the planet." Measurements of Saturn's gravitational field could help scientists determine how much hydrogen and helium are in the outer layers of Saturn, as well as the quantities of heavy elements concentrated in the core, Iess added. Past studies indicated that Saturn's magnetic field is weaker than expected and that, surprisingly, it's aligned with the planet's rotation. Scientists might be able to explain those unexpected findings if they can identify the sources of Saturn's magnetic field with measurements from Cassini's magnetometer. Gravitational and magnetic measurements together could also determine the depth of Saturn's strong winds that whip at up to 500 mph (800 km/h) and produce the huge bands in the planet's atmosphere, Iess said. Scientists at EGU reflected on the past 13 years of discoveries by Cassini, which is a collaboration among NASA, the European Space Agency (ESA) and the Italian Space Agency. "Nothing that came out of this mission was really expected or imagined or modeled before," Coustenis said. "We had many surprises that actually led us to review our models, led us to rethink our whole concept of the outer solar system." For example, because of Cassini data, scientists have had to revise their understanding of the habitable zone in the solar system, Coustenis said. While it was once believed that habitable bodies needed liquid surface water as on Earth, solar system objects such as the icy moons around Jupiter and Saturn — many of which appear to have subsurface oceans —are now a new source of excitement. Recent findings based on Cassini's observations of Saturn's moons Titan and Enceladus "have proved to us that the habitable zone is actually not restricted to surface habitats; we could have liquid water under the surface," Coustenis said. J. Hunter Waite, a scientist at the Southwest Research Institute in San Antonio, recently led a team of researchers in analyzing observations made by Cassini during an October 2015 dive through a geyser plume shooting out of Saturn's icy moon Enceladus. Their results, which were published earlier this month, suggested that life-sustaining chemical reactions could be occurring in Enceladus' subsurface ocean. "We got water; we got organics; we got an energy source," Waite told reporters at the news conference. "This place is by all accounts a habitable ocean in the interior of Enceladus, and that's quite exciting." But Waite told Space.com that a new mission with new instrumentation will be needed to really search for life. There are two missions being prepared that could further explore the question of habitability in the subsurface oceans on icy bodies in the outer solar system: ESA's JUICE (Jupiter Icy Moons Explorer) mission, planned to launch in 2022, and NASA's Europa Clipper, planned to launch sometime in the 2020s, which will investigate Jupiter's icy moons Ganymede and Europa, respectively. Regardless of what they learn from future missions, scientists will be trying to make sense of Cassini data long after the spacecraft's final plunge. "I worked on the Voyager mission 10 years after the mission itself," Coustenis said. "You can imagine how long we're going to be working on the Cassini mission in the future."